Sometimes you know that you have done wrong. I had a lot of information regarding Susan R. Vincent/Vinson and as I looked at her information I saw that many of my sources were missing and were cited poorly in other cases. Much of what I had was done on Ancestry years ago and the citations pointed to Ancestry.Com, but didn’t have enough detail for someone without access to my Family Tree Maker or without access to my tree on Ancestry to access find the information. Not good. So, I decided to clean up my sources and make sure that they stand on their own. I left the links that Ancestry puts in to the source document but I also added a copy of the document into the attached media. I set the media to “private” because I don’t care to have my copies of the data uploaded back to Ancestry. I really hate it when I do a search on someone and the search results include other people’s copies of census pages. I also wish that Ancestry wouldn’t return things I’ve posted in my searches, or I wish that at least they’d give me a button to turn that off. So anyway, for Susan I cleaned up my sources, changed my preferred name for her from Vincent to Vinson, and did some more research to add a bit more detail into what I know about her life. Susan R Vinson was the third child of John and Lenora Busbee (possibly Beasley) Vinson in Halifax County, North Carolina, on 22 August 1848. [i] The only source for this date is her grave marker, however, the date is consistent with the 1850, 1860, and 1900 Census records. I have been unable to find her or her husband Peter F. Howell in the 1870 Census. The 1880 Census indicates that she was 33 and she should have been 31 at that census date. I believe this to just be an error in that census. There is a name change for her mother in the 1860 Census, from Lenora to Ellenior [Eleanor?] and a change in birth years from c. 1818 to c. 1825, which indicates to me a different wife. There is also a four-year gap between Susan and her next younger brother, James. Because of this, I believe that Susan had a stepmother and the rest of her siblings were half siblings. The 1860 Census also indicates the family surname as Vinson and that they were living in the “Western District,” Halifax County. (Again note the 1860 Census does not indicate relationships within the household.) Their post office was Weldon, which probably was the closest town. I am sure that the Civil War was a difficult time for a young teenage girl. Shortly after the war, on 10 Dec 1866, the 18 year old young woman married Peter Fletcher Howell. Peter was a CSA Veteran who, although from Halifax County, had joined up in Virginia to be part of Virginia’s 61st Infantry Regiment. As might be expected, 10 months later they had their first child, Anna Lee [or Annalee] on 8 October 1867. There is a six-year gap between Anna Lee and John D. That would make me think that there may have been another child born to Susan between 1868 and 1872, however, the 1900 Census indicates that she had five children all of whom are living. So, now I am really confused because I’m pretty sure that she had seven children. I speculate, that she had more than the five children noted in the 1900 census and that she actually had eight children, three of whom had passed before 1900. I certainly need to do more research to prove this speculation. During the 1880 Census, they are living in Faucetts [Faucett] Halifax County, North Carolina, USA. Susan is keeping house for Peter and their first five children. [iii] In 1886, her oldest daughter, Anna Lee was married. Her son, David Bushrod Howell, was married on 26 December 1907. Susan R Vinson Howell led a simple life. She was the daughter of a Halifax County farmer, married a Civil War veteran who farmed the land in Halifax County after the war, She had fat least five and probably 8 children, and died at age 61 in Halifax County as simple farmer’s wife. Search for a timely and/or primary source for Susan’s birth. Research Susan R. Vinson Howell’s children closely for a missing 8th child and for the deaths of several of the children before 1900. Research which of the Baptist Churches Susan’s funeral was held at. 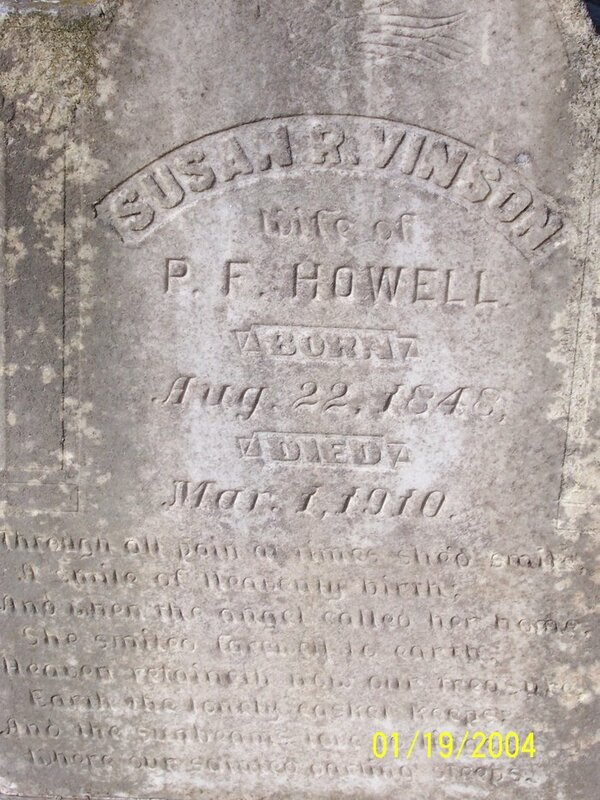 Memorial# 82126013 – Susan R Vinson Howell. http://www.findagrave.com/cgi-bin/fg.cgi?page=gr&grid=82126013. Carolina; Roll: M432_633; Page: 34A; Image: 73. District: 137; Image: 0720. Family 175. District: 0027; FHL microfilm: 1241199. Howell, P. F.
– P. F. Howell. http://www.newspapers.com/clip/1156689/the_roanoke_news/?.